Next time you need to maintain your asset in Logan, we ought to do everything we can to ensure they reflect our personal preferences in style and design. Fashion trends change quickly nowadays, and our tastes tend to change along with them. Unfortunately, even though redecorating homes can be exciting, it’s also a lot of work, especially regarding disposing of all the resulting waste. You may not end up with lots of junk by repainting the walls or adding new furniture to a room, but large-scale revamps result in more waste than you might expect. Depending on the scale of your revamp, you might need to dispose of old furniture, wallpaper, bricks and debris, scrap metal, and floorboards, and you won’t be able to fit all that into your wheelie bin for the weekly collection. Plus, you may not wish to fill your car with dirty waste and drive to the landfill and back several times. Fortunately, reputable companies make skip hire in Logan simple, allowing you to concentrate on your revamp efforts while the professionals dispose of your waste. At Lightning Skips, we provide skip bins in various sizes to homeowners in Logan and beyond. From mini skips to huge bins, we have whatever you need to dispose of your junk quickly. As a new, family-owned business, we’re making a name for ourselves by providing a prompt, reliable service without the premium price tag, and we’re happy to offer advice if you’re unsure of which skip you need. Keep reading below for some top tips on how to use your skip bin in Logan efficiently and safely. Don’t simply sling everything into your skip bin – It’s a good idea to break things down whenever possible to make the most of your skip bin’s space. You can usually dismantle old furnishings to ensure they don’t take up too much space, and it’s worth placing waste into your skip with care to prevent unnecessary gaps between junk. Make sure your bin is unloaded appropriately – If you need the skip bin for several days or a week, you need to ensure it doesn’t get in your or other people’s way. Our professionals will place your bin appropriately so that you can still drive to and back from work efficiently. Keep children out of the way – People may throw waste into your skip bin without paying much attention, so it’s important to keep kids out of the way to avoid any accidents. Also, take care not to overfill your skip to ensure safety at all times. At Lightning Skips, we want to make your revamp as simple as possible by making waste disposal easy, and we can deliver skips the very same day you place an order. 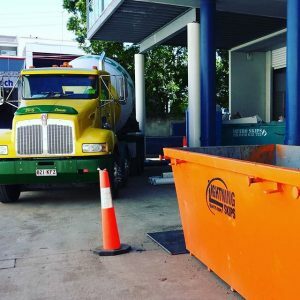 If you need any advice regarding the type and size of skip you require or would like to hire a skip in Logan, contact us on 0472 975 477, and we’d be glad to have a no-obligation chat. Otherwise, head over to our homepage and use our online booking form on the homepage to get a quote or book a bin today!